Pharmacotherapy: A Pathophysiologic Approach is written to help you advance the quality of patient care through evidence-based medication therapy derived from sound pharmacotherapeutic principles. The scope of this trusted classic goes beyond drug indications and dosages to include the initial selection, proper administration, and monitoring of drugs. You will find everything you need to provide safe, effective drug therapy across the full range of therapeutic categories. 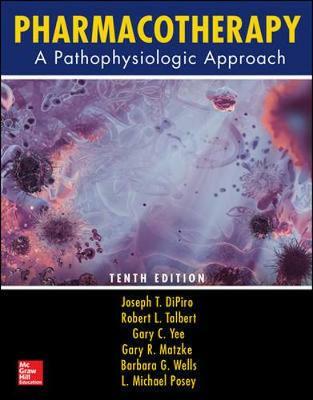 Presented in full-color, the Tenth Edition is enriched by more than 300 expert contributors, and every chapter has been updated to reflect the latest in evidence-based information and recommendations. This sweeping updates include tables, charts, algorithms, and practice guidelines. This edition is also enhanced by a timely all-new chapter on Travel Health.